When I think of frozen breakfast products - I think fast, easy, convenient. 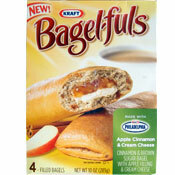 Unfortunately, Kraft Bagel-fuls fail on all accounts. This product - though it can be made to be quite tasty, is riddled with conceptual flaws, and left me frustrated and underwhelmed. I set out to try to improve my biggest pet peeve - the thawing of the Bagel-ful. I tried toasting it straight from the freezer, toasting it on low for 3 cycles. The outside was burning hot yet the inside was still frozen. Then I tried microwaving it for 30 seconds and then toasting it twice - based on the original directions. This worked very well - giving me almost identical results to the thaw and toast method. The only negative was that the bagel texture got even more chewy - and it was chewy to start with -so we're talking super-dooper chewy in the end. There are a few other things that I found really disappointing about this product. You have to carefully balance the Bagel-ful on its end in the toaster. Otherwise it's impossible to get it out. It falls down to the bottom on its side, and you have to unplug the toaster, find a utensil to stick in there and try to spear it to get it out. Also, when these are done toasting, the outside is so hot it's impossible to hold. Even if you let it cool down, it's not really a grab-and-go type item because the filling tends to ooze out the other end as you're eating it. If you're looking for a breakfast on the run, do not expect to pop this out of the toaster and run out the door. Even when the outside is cool enough to hold, the inside filling can still be mouth-blistering hot. So be careful if handing this to your youngster - for the sake of his mouth AND your upholstery! 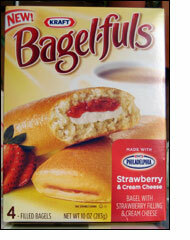 If you're looking for a bagel with cream cheese and fruity topping, pull out the jam and tub of cream cheese yourself. These are a big disappointment. A huge thanks to Kellie D. of Hollywood, CA for emailing me this review. Please comment below and let us know what you thought of this product. If you'd like to review a product not shown on this site, please email us your review. What do you think of Bagel-fuls? These are amazing! Quick and easy. I like the apple ones. Oh yeah... actually heat it in a microwave! Are you joking?! You're suppose to microwave them. They don't take that long. Why the heck didn't you just keep them in the fridge and THEN toast or nuke them? And if they bother you being drippy so much, why not eat them plain? They don't ooze if you don't heat them. I love Bagel-fuls AND I don't usually heat them at all. I buy them already defrosted and let them sit on my desk for another 5 or 6 hours then just eat them! yum! I love them and microwave them.. cuz thats what the box stated to do... that girl is crayz. What? What about MICROWAVING them? These are great on the go, have and overall satisfying taste and I really can't complain. Please, don't complain about this product before you try microwaving it. That's how I do my poptarts; if I wanted to toast them, I'd use my toaster oven. Regular toasters are so old and hrs to depend on. 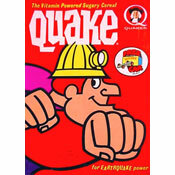 I tried these when they first came out - I thought they were horrible! The bagel was way too chewy & the filling had a weird gooey texture to it. Also, the bagel was too soggy around the filling. I ended up throwing out the whole box because I could not stand the thought of trying to eat them again! We've tried a couple of the varieties with just cream cheese filling and liked them straight out of the refrigerator. Eaten that way we've found them good for munching on while walking in the morning. I really like the Apple and Cream cheese, although I do agree, they were pretty chewy. Overall, 4 out of 5.